Eddie Ybañez fondly recalls his journey with MiCab and the many uncertainties and multiple challenges they experienced. All are memories now but everything that they went through paid off since they are now present in the market. “We were just sold to our idea and we fought for it in order to survive” Eddie shared to the audience. 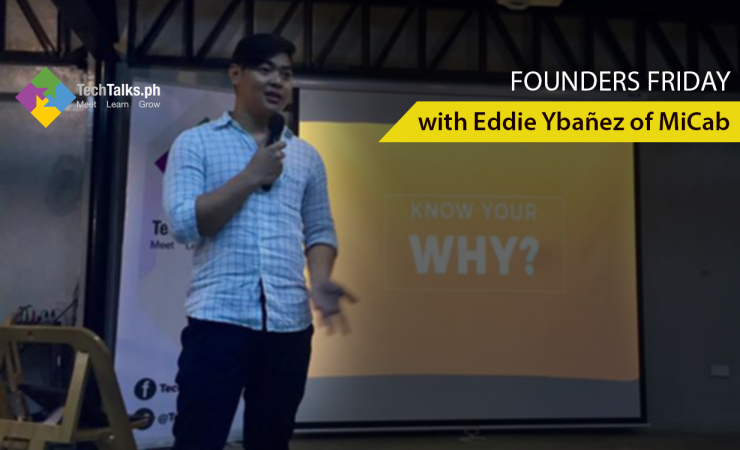 Eddie Ybañez, founder of the startup company called MiCab shared to almost 60 people who attended Founders Friday at A Space Cebu last May 5, 2017 about their journey, how they started as a startup, what they have done in order to get launched , how they were able to survive the market considering the competitions with their product and the lessons he learned along the way. “It was not an easy ride, I admit, we met many hurdles, but if you know your why and what your product is, then, I am pretty sure, you will survive the market”, Eddie shared. Micab is Philippines’ new mobile application for booking a cab. They aim to change the way people travel as they bring people and their cities closer. They partner together with leading taxi companies using technology to make transportation easy, comfortable as possible. As one of the most innovative transport on-demand platform companies now, MiCab fixes critical transportation problems and make traveling easy for millions of Filipinos and soon in South East Asia. Micab is focused on creating a strategic eco-system for taxi companies, drivers and passengers, pioneering new moving alternatives with a perpetual emphasis on safety, reliability, affordability, and convenience. MiCab currently offer services in the Philippines, soon expanding to major cities of Thailand, Indonesia and Vietnam.